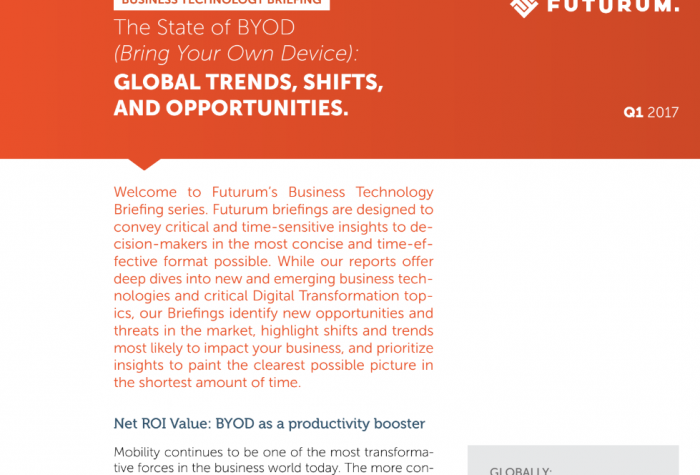 Futurum Business Technology Briefings are designed to convey critical and time-sensitive insights to decision-makers in the most concise and time-effective format possible. While our premium reports offer deep dives into new and emerging business technologies and critical Digital Transformation topics, our Briefings deliver only the must-know details of the critical topics they cover. The State Of BYOD focuses on the most relevant global trends, shifts, and opportunities associated with the practice, and delivers actionable insights into how to leverage BYOD to deliver positive business outcomes and improve competitiveness. This Briefing will be particularly useful to CTOs, CIOs, CDOs, CEOs, and COOs.